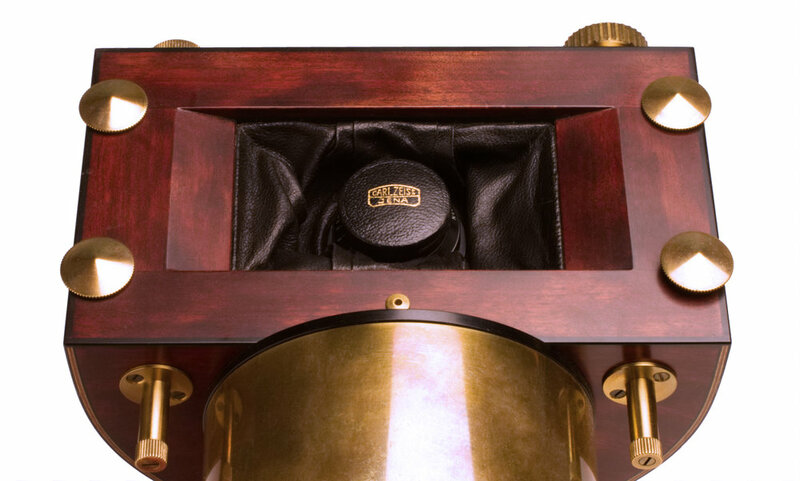 With a penchant for invention and a love of 19th-century aesthetics, artisan camera-maker Kurt Mottweiler’s 6x17 swing lens camera is the perfect combination. Affectionately referred to as the ‘Jules Verne’ camera, Mottweiler constructed it in 1998 and it débuted at the International Association of Panoramic Photographers conference in Banff the following year. Equipped with a 75mm Zeiss Tessar lens, the 6x17 image area allows for a 140-degree panoramic view to be rendered on 120 film. The camera is capable of shutter speeds ranging from 1/250 to 2 minutes in single stop increments. The initial concept was for a swing lens camera with a conventional clockwork drive, but Mottweiler opted instead for the precision and wide exposure range offered by a closed-loop servo drive. Using a microcontroller and Swiss-made Maxon drive motor, he programmed the camera’s functions using FORTH, an obscure programming language. Mottweiler completed the camera in five months with learning and implementing the programming language taking the majority of his time. Photo made with 6x17 swing lens camera. View more of Mottweiler's work on his website.